Wow, I said it, and I put it in writing. A non-Rebate firm educating their customers and readers about something that we don’t do*… REBATES. Will this be suicide for my business? Shouldn’t that be kept secret? Why tell potential clients about your competition, which might be a better deal that they didn’t know existed? Why? Because I think buyers should know about all their options, and decide what is best for them. Rebating is not bad. It is NOT the devil, it is just another business model. First of all, what is rebating, isn’t it illegal? Why would a Realtor be stupid enough to do this? Agent #2 uses rebating as a marketing tool and as a result might do 4 deals within the same amount of time. Lets say each commission is $10,000. Who is the dumb one? The rebater makes 30% more! That doesn’t sound too stupid to me! Confession… When I first started I used to almost always rebate! Why not? I was brand new, FranklyRealty.com just started (long story) and I had to find a competitive advantage. I didn’t have a good reason why the heck Joey should use me over his Mother’s cousin who has been in the business for 20 years? Tell me what other industry doesn’t first compete on price to break into the market? My rebating techniques got me in , and on the Discovery Channel’s Double Agents reality show. They mentioned my rebating including my “REBATE” license plate. I got a ton of deals from that. And my Internet marketing was hot. 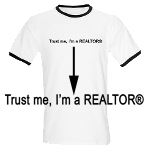 Heck, look to see who owns RebateRealtors.com and RebateAgents.com. Yeah I made less per deal, but I was doing just fine, I made it up with quantity. I was also named 2003 Northern Virginia Association of Realtors Rookie of the Year, out of 1,000 new agents, and I did that in just 6 months, even though Rookie agents were given 18 months. Why did I stop rebating? I kinda got good. (I’m not saying rebaters are bad). I finally had a reason why people should use me over Joey’s Mother’s cousin. I had one client that wanted to buy a house listed at $600,000. They were ready to pay full price. I ran through my dozen proprietary how-to-price techniques (that I can’t publish in my blog, just email me for more info). I call it a CRA report (patent pending). Not a CMA, Comparative Market Analysis (which everyone does), but a CRA, Comparative Realtor Analysis. This is a background analysis of the agent’s past performance (not a bad idea heah? Imagine what else I have up my sleeve, the CRA was featured in Smart Money magazine). I saw that this listing agent in 5 recent listings dropped her price by $25,000 after exactly 30 days. Obviously this was how she got deals. She would convince sellers to use her because she said she could get a high price, and after 30 days would drop the price and sell it fast. So there was a good chance they would do that with this listing. With 28 days on the market we offered $30,000 under and… they took it. of my commission. At that point my focus changed to helping the client save as much money possible, without having to sacrifice my pay. So are you saying that we should or should NOT use a Rebate agent? I’m saying you definitely SHOULD use them if you think all Realtors are just overpaid paper pushers. However if you read my entire “insider scoop” blog and see that there is more to it, you should pick the best agent, and if perhaps you find one that also rebates, good for you! I recently had a buyer that said “Well I have a friend’s friend that will give me 1% back if we buy with her.” I said in return, “Really, I can find somebody that might give you 1.5% back.” I had a new agent in mind that would love to make a quick $10,000, but will the buyer get the lowest net possible? In the end is that cash back worth it if the agent isn’t as good at getting you the lowest net possible or giving you the time, dedication and hand holding that you might need? I got the deal and it took 4 weeks after we found a home they liked. We offered on 2 homes, one $300k below list, and I found them 2 off the market properties from my letters. I don’t know if a rebater would have been as patient and aggressive. Maybe they would be. My clients were very happy in the end. Discount firm vs. a known non-discount brandname firm! I’m excited. What a brilliant idea! I ran an analysis comparing the negotiating abilities of one discount firm’s closings to another well known firm (not mine). What I was hoping to show was how a rebater might give you money back, but if they didn’t fight to get you that last $5k or $15k, how much do you really save with a rebater? Your NET is what should matter, right?! But guess what?! My numbers showed that the rebating firm was a better deal! Ha! Oh no! Do I ditch my blog? Nah. $1,250 on a $500k home, … on average. But you need to ask, what would an above average agent have been able to net you? I Need A Buyer’s Agent! But For My Car.? Tip #1 From Mom: Don’t Trust Realtors That “Sell” You On Buying. Also ask yourself whether the agent you are considering will give you this type of information (including telling you about rebates) and whether they put you first or their commission first. Ultimately if they mesh with your style, great. If they also rebate, great, go for it. go up, they really need to get this under contract this week.” Maybe he was playing me, but I don’t think so. Acquisition approach. Do they treat your purchase like an acquisition of a company? With research on all parties involved, (including once going to the courthouse to find the existing loan amount) or do they just run a CMA and tell you it is a great deal? CRA Reports Run a CRA report (as seen earlier in blog) or do they not even know what it is or why it would be important? Off Market and FSBOs. Look and find properties off the market. Lowering those darn Realtor fees can net you a better deal. But it takes 3 times the work for a Realtor. Give you a rebate. Some will, some won’t (we don’t). Get you the lowest negotiated price. This is what matters (along with service). In the end, that “free money” rebate might end up costing you much more. I used to rebate… but then I got good. Could you please tell me which part of buyer’s closing cost can be covered using buyer agent’s rebate in California? The closing company should know best. Usually all of them, but it changes by each state. Hi Mr. Llosa: As the trademark administrator in the legal affairs division of the NATIONAL ASSOCIATION OF REALTORS®, the website rebaterealtors.com was recently brought to my attention. I note that you are selling this domain name. As you are aware this is not a proper use of the REALTOR marks in a domain name. I respectfully request that you inform any prospective purchasers that this domain name contains a federally registered trademark and the owner of this trademark will request that it not be used on the Internet. I am including a link to a short video that was created to help our Membes understand the correct use of the terms REALTOR and REALTORS below. Please enjoy. Real estate agents should have a more tiered compensation structure. A flat 3% is crazy on a million dollar home. Even if the agent helps the client net 5% more? It is about value, not about what is charged.